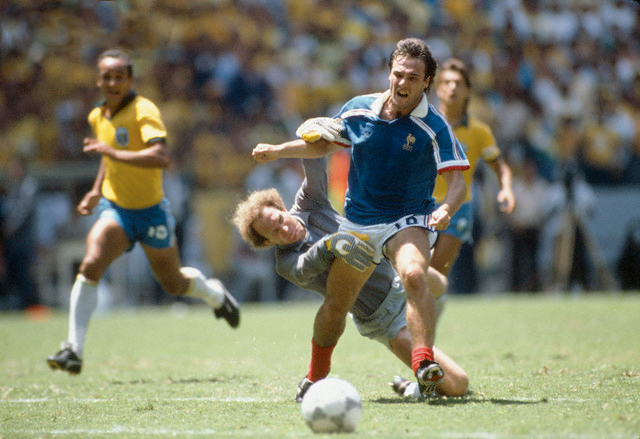 The 1986 FIFA World Cup in Mexico produced quite a few incredible moments and matches, one of which was the meeting between France and Brazil in the quarter-finals. Still regarded as two of the best teams to have never won the cup itself, the two put on a show of skill and speed like no other in that particular tournament. Four years earlier France made it all the way to the semis, losing to West Germany and then Poland in the match for third place. Brazil on the other hand were eliminated in the second round by Italy despite having one of the most skilled teams ever. With the likes of Junior, Zico, Sócrates, and Falcão in the squad, Brazil was seen as the team to beat despite being 16 years removed from their last World Cup title. With the French having already eliminated defending champions Italy in the previous round, this was bound to be a great match. For French captain Michel Platini this would be a very special match as he would both play a massive role in it and as it was contested on the day of his 31st birthday. The Brazilians did not wait long as São Paulo striker Careca put the South Americans on top just seventeen minutes into the match. But the French proved to be able to match Brazil's speed and with high tempo and skillful play got back into the match after some incredible early displays from Brazil. Birthday boy Platini made the difference as he would tap the ball in to tie the match at one goal a piece about 5 minutes before half-time. But it would not be the last time Platini would be involved in the match. After an incredible (but scoreless) display of football the rest of the way, the two would face off in the penalty shootout in order to determine who would go on to play in the semi-finals. Brazil's confident midfielder Sócrates would step up for the first shot, but an incredible left handed save from French keeper Joël Bats set the tone right off the bat. The next six penalty shots found the back of the net and the score was tied at 3-3 with Brazil having shot once more than the French. Up came Michele Platini; having already celebrated the match-tying goal, a good spot-kick would put all the pressure on the Brazilians. Platini's attempt sailed high and wide as the captain tried to place the ball in the top corner to his left; after four shots a piece, the match was still tied. Brailian fans at the Estadio Jalisco in Guadalajara did not have much time to celebrate Platini's miss however, as center-back Júlio César would put his shot right off Bats' rigth post. The pressure was all on France's Spanish born midfielder Luis Fernández and of course Brazil's keeper Carlos. Fernández did not attempt a fancy shot, but simply put the ball in the bottom left corner; with Carlos going the other way France were moving on in one of the most skillful matches in a World Cup tournament.